Sheer existence is, perhaps, the greatest mystery of all. What God has made is like a toy compared to the complexity and depth of who God is. All the sciences that scratch the surface of the created universe are mere ABCs compared to Christ’s exhaustive knowledge of the created universe. Hatred for the truth is not easily defeated by facts. P.S. Piper takes no position on the age of the Earth, and elders within his church are free to accept an old Earth. When I wrote about this last year, some commenters were sure that I was twisting Piper’s words, and they twisted his words to prove it to me. We all want progress. But progress means getting nearer to the place where you want to be. And if you have taken a wrong turning, then to go forward does not get you any nearer. If you are on the wrong road, progress means doing an about-turn and walking back to the right road; and in that case the [man] who turns back soonest is the most progressive. . . . And I think if you look at the present state of the world, it is pretty plain that humanity has been making some big mistake. We are on the wrong road. And if that is so, we must go back. Going back is the quickest way on. But silence before the Word leads to right hearing and thus also to right speaking of the Word of God at the right time. The most promising method of prayer is to allow oneself to be guided by the word of the Scriptures. A Christian fellowship lives and exists by the intercession of its members for one another, or it collapses. Only he who lives by the forgiveness of his sin in Jesus Christ will rightly think little of himself…. Because the Christian can no longer fancy that he is wise he will also have no high opinion of his own schemes and plans. We must be ready to allow ourselves to be interrupted by God. God will be constantly crossing our paths and canceling our plans by sending us people with claims and petitions. We may pass them by, preoccupied with our more important tasks, as the priest passed by the man who had fallen among theives, perhaps–reading the Bible. He who is alone with his sin is utterly alone…. The pious fellowship permits no one to be a sinner. So everybody must conceal his sin from himself and from the fellowship…. The fact is that we are sinners! The misery of the sinner and the mercy of God–this was the truth of the Gospel in Jesus Christ. We must ask ourselves whether we have not often been deceiving ourselves with our confession of sin to God…. And is not the reason perhaps for our countless relapses and the feebleness of our Christian obedience to be found precisely in the fact that we are living on self-forgiveness and not a real forgiveness? I highly recommend this book for its Christ-centered approach to Christian fellowship. 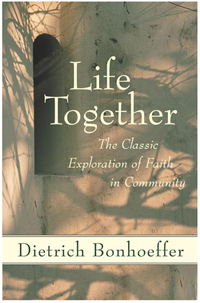 I’m re-reading Life Together by Dietrich Bonhoeffer, subtitled “The Classic Exploration of Faith in Community.” At 122 pages, it is not a long book, but it is a gem. I know that Bonhoeffer was a bit liberal theologically, but the Christ-centeredness of his writings puts to shame much of what goes on in Evangelicalism today. He [the Christian] knows that God’s Word in Jesus Christ pronounces him guilty, even when he does not feel his guilt, and God’s Word in Jesus Christ pronounces him not guilty and righteous, even when he does not feel that he is righteous at all. If somebody asks him, Where is your salvation, your righteousness? he can never point to himself. He points to the Word of God in Jesus Christ, which assures him salvation and righteousness. 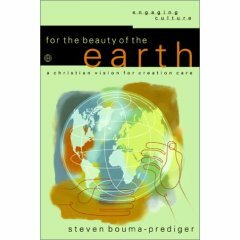 …the goal of all Christian community: they meet one another as bringers of the message of salvation. Christian brotherhood is not an ideal, but a divine reality. Christian prayer takes its stand on the solid ground of the revealed Word. It is not in our life that God’s help and presence must still be proved, but rather God’s presence and help have been demonstrated for us in the life of Jesus Christ. It is in fact more important for us to know what God did to Israel, to His Son Jesus Christ, than to seek what God intends for us today. Our salvation is “external to ourselves.” I find no salvation in my life history, but only in the history of Jesus Christ. It is not our heart that determines our course, but God’s Word. Prayer should not be hindered by work, but neither should work be hindered by prayer.